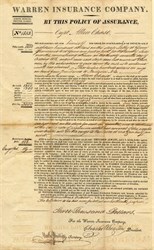 Historic insurance policy from the Warren Insurance Company for Sloop Sally issued in 1818. 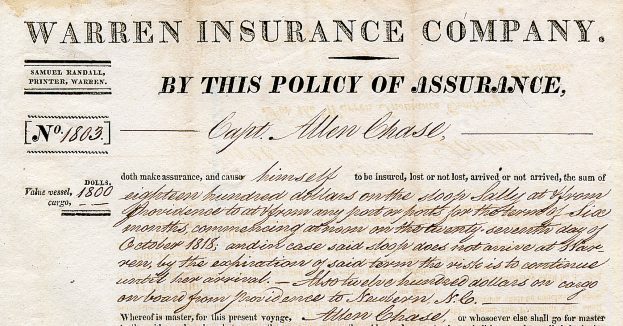 Insurance policy to Captain Allen Chase for the Sloop "Sally" is for coverage of $3,000 for a trip from Providence to New Bern, North Carolina. coverage includes "the dangers of the seas, of fire, enemies, pirates, assailing thieves, restraints and detainments of kings . . . and all other losses and misfortunes". This item has the signatures of the Company's President, Charles Wheaton and Secretary, Nathan Phillips and is over 190 years old. 10" x 16", some signs of wear on folds, professionally reinforced, overall fine. This would look terrific framed. Printed by Samuel Randall, Printer Warren. Marine Insurance began in this country in 1724 by individuals underwriting the insurance on cargoes and vessels belonging to their compatriots. But it was not until the 1790's that stock companies like the Warren Insurance Company were formed. 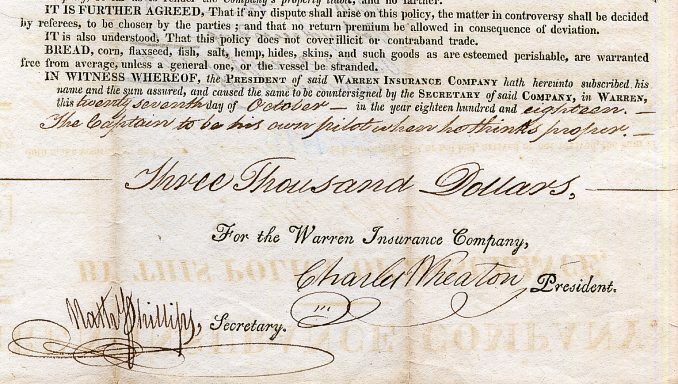 The Warren Insurance Company was chartered in 1800, and operated until 1844, paying an average dividend of fourteen percent annually. The period covered in this collection was one of turbulence and insecurity; the War of Independence had ended on paper, but it was an uneasy peace. War with England was to flare up again in 1812 and hostilities were to continue in the Caribbean and overseas. The owner and insurer of any merchant vessel ran considerable risk of loss not only form natural causes, but also from privateers and/or being impounded in hostile ports. Nevertheless, vessels continued to bring to New England harbors cargoes of sugar, molasses, salt and coffee from the West Indies; tea from Canton; wine from Spain; coal, bricks and copper from England; and cotton and lumber from the South, as well as exporting lumber, cotton and grain abroad. Insurance was underwritten on a named vessel for a specific length of time, on a named vessel and its cargo for a specific voyage, on the cargo of a specific vessel, or on a specific cargo carried by "any good vessel' in cases where no more than a certain percent of the total insured cargo could be carried at any one time. When this policy was issued, Warren, Rhode Island was a busy port and one of the largest shipbuilding towns in Rhode Island. John R. , Nathaniel M. and Charles Wheaton, John T. and Sylvester Childs Jr., John Haile and Nathan Phillips, who were among the Directors of the Warren Insurance Company, were prominent Warren ship owners and business men.